This week, I’ve been reading Marie Kondo’s book, The Life Changing Magic of Tidying. As a fairly (ahem) messy and untidy person, I’m yet to put her method into practice, but a third-or-so of the way through the book, it’s apparent that the KonMari method is essentially about reducing your stuff. Or to put it another way – editing your possessions. Marie Kondo says that by getting rid of possessions that you no longer need and that don’t give you joy, you create space in your life for the things and activities that do matter to you. It’s an intriguing idea in our busy-busy-busy society where the refrain of “I don’t have time” is almost seen as a badge of honour. And while I’m yet to start culling my possessions, the concept makes sense to me. After all, I know that as a writer and editor, editing is the difference between an ok piece of writing and a great piece of writing. Editing allows you to focus on what it is you REALLY want to say and communicate, and strips away anything that doesn’t serve that goal. Editing allows you to choose the words that say what you REALLY mean. Editing gets rid of those spelling, punctuation and grammar errors that cause confusion and cloud your message – or just make you look unprofessional. 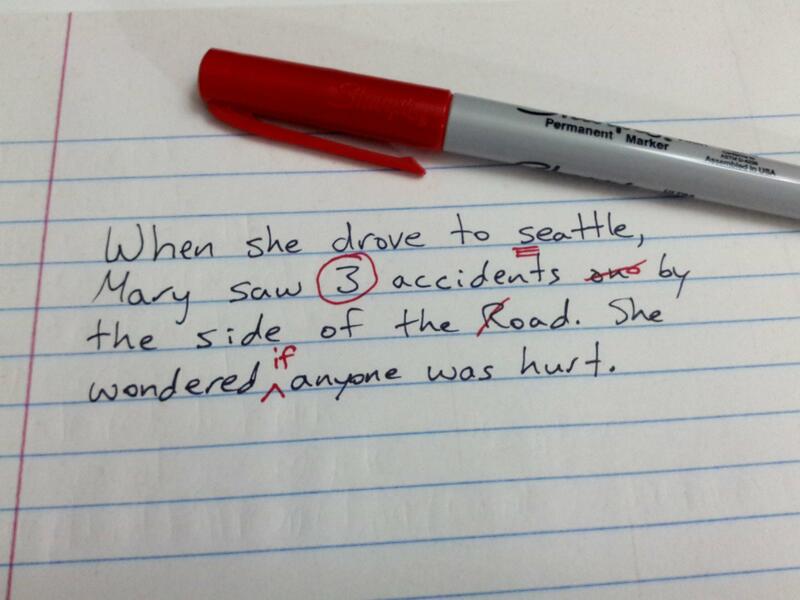 Don’t fear the red pen! Editing helps to clarify your message. But I’ve just got so much to say! Awesome, having a lot to say is great and can help you to develop a strong pipeline of content. Editing will just help you to structure that content in a way that is focused, structured and makes sense for the audience. Think about Game of Thrones – the TV show – versus A Song of Ice and Fire – the book series. George R.R. Martin’s saga, with multiple volumes each spanning a thousand or so pages, is a fairly niche read. It’s complex with many story lines. In comparison, the Game of Thrones TV show is still complex, but a lot of the detail and side-plots have been stripped away. The overarching story – the key message, if you like – remains intact, but there are less distractions for the audience. If they want more information, there’s always the possibility to read the books. Similarly, with your content, if you find yourself trying to fit too much in, or going down tangents, editing can help you to bring your focus back to the message and goal. It might be that those tangents would be better served in a separate piece of writing. Writing can often be hard work. You sit there starting at a blank screen for ages waiting for inspiration. When the words do come, it’s like opening a door to your thoughts and exposing them to the world. I get it, to then have someone come along and rip those words apart can be painful. Or you hastily bash something out and quickly post it on your website without reviewing because you know that blogging for your business is something you should be doing, and you figure that anything is better than nothing. But are you saying what you really want to say? Editing can help to structure your words and just make everything a bit more clear and shiny. It doesn’t mean that it will lose your personal voice or that everything will be rewritten. Sometimes some simple tweaks in structure can make a world of difference to the flow and clarity of a document. Equally, a few word changes and a check for spelling and grammar errors can make your copy sound more professional and appealing to current and prospective customers. So don’t fear the red pen, embrace it. If you’d like to find out more about my editing services, I’d love to hear from you. Have you ever used an editor and did it help to make your message clearer? Equally, did throwing out your excess possessions improve your life and make you happier? I’m really keen to know. Give me the encouragement I need to declutter my life! I’m much better culling other people’s words than I am my stuff, clearly. Award submissions are a fantastic way to showcase your work and achieve recognition. Winning an award – well that’s even better! It gives you permission to shout about your success from the rooftop and has the credibility that comes from being endorsed by a third party. But, having coordinated award submissions across Asia Pacific for a mid-tier PR agency, I know that writing award entries can be fraught with potential pitfalls. Here are my tips for writing an award entry that will make the cut. So you think that you can’t possibly tell the full story of your glory in only 2000 words? Wrong, of course you can, and what’s more sunshine, if you want to win, you’re going to have to stick to the word count! The judges aren’t going to look upon you kindly if you’re the 47th entry and you’ve gone over the word count by 50 percent. Most awards have clear guidelines that will direct you on how to structure your submission. Use this structure to your advantage to organise your thoughts and distil key information appropriately. Structure, headlines and bulletpoints are all your friends. I can’t emphasise this enough – READ THE CRITERIA. Make sure you are selecting the most appropriate category for your submission. This is not a case where more is better. Pick your category carefully and make sure your entry truly and clearly addresses the selection criteria. Sticking to the word limit is a vital element in successful award entries. Every year for various regional PR awards, I would review the award guidelines and create a template for my teams which adhered to the formatting rules outlined in the awards entry kit. This would include the appropriate section headings, font selection and size, and any other formatting restrictions. And I guarantee you that every year I would receive draft submissions that did not follow this structure at all. If I had been the judge, rather than an internal editor, I’d have put them on the discard pile, no matter how great the content might have been. Make reviewing your entry easy for the judges by including information in the format they have requested. It doesn’t matter how great your product/service/campaign is if you can’t prove it. And your word isn’t going to be good enough – this is where you should be thinking hard numbers, like ROI, or sales data, or any other measurable metrics. If you don’t have the supporting evidence to illustrate your success, then I’m going to be blunt and tell you not to bother. Award entries take time, effort and money to put together. Look at the awards criteria and if you can’t produce the necessary supporting materials or data, then the judges aren’t going to consider your entry to be credible. Even if you don’t win, the process of preparing an entry can provide you with a selection of material that you can repurpose into other marketing documents, such as a case study. Indeed, preparing for and entering awards should be a considered part of an integrated marketing campaign. Need help writing award entries? Does preparing award entries freak you out? Or do you find yourself missing deadlines and then being disappointed when your competitors win instead of you? If you’d like to have a chat about how to improve your award entries and boost your chance of success, then contact me. I’d love to chat about how we can get you the glory that comes with winning. There’s only so much you can write about a topic, right? Wrong! I say there is no end to what can be written about a topic when you take a moment to step back and think about the various audiences and what they need to know about a topic. And for any piece of writing (or any communication! ), the audience should be absolutely your first and most important consideration. So for all those people out there who know that content is important and that fresh, unique content helps Google to find you, but don’t know where to start – start with your audience. This will help you to develop a strong list of topics that you can then refine and create an editorial program that will help boost the credibility of your website. Want to develop fresh, unique content? Start with your audience. Let’s use an example. Say you’re a psychologist that specialises in youth mental health. What audiences can you write for? There’s your potential patients, their friends and peers, parents of adolescents, teachers, other medical professionals, government of various tiers, local health and community services. What topics are relevant to each of those audiences? Let’s brainstorm together now! And there you go, without even breaking a sweat, we’ve got enough topics for a 400-500 word blog post every couple of weeks for at least half a year. Through in some commentary on topical news items, book reviews, round ups of online resources and pieces on key events (eg RUOK Day, Mental Health Week etc) and you’ve got a strong editorial calendar in place. Do you need help coming up with ideas for your content marketing? Or have the ideas but no time to actually write the content? I’d love to discuss how I can help you. Contact me and we can arrange a time to figure out your specific needs! I know she was looking for some secret, but really there isn’t one. Like most things in life, it comes down to do you want to do this, and if you do, you’ll make it happen. Through our conversation, it quickly became apparent that my friend didn’t have the motivation to do the course. Her previous employer had paid for her to do the course to boost her skills for a role she had been promoted to, but that organisation had lost its government funding, so she’d taken a new role no longer in that field and the new skill set was not something that she saw herself pursuing a career in down the track. So, after our little discussion where my friend agreed that she needed to think about whether or not the course was actually a priority for her, we turned our discussion to how I had fit online study into my life, in case she came to the decision to commit to her course. Through the course of my degree I found out I was pregnant, moved house, severely sprained my ankle at 5 months pregnant, had gestational diabetes, obviously had the baby (and took 3 months off from study), my eldest daughter started school and I started a new job. I did stints of doing a full time study load and a part time study load. The most challenging time was my final study period where I was doing a full time load in order to finish the degree (as my final two subjects were only being offered once during the year and I knew that if I took 9 months off between those two subjects I would never finish the last one), my sensitive big miss had just started school and I had a new part-time job. As you can see, there were the usual ups and downs of life to contend with. But I ALWAYS made time for my study commitments and never once asked for an extension to complete an assignment. Sometimes this meant I was up late at night and early in the morning, sometimes it meant I was listening to lectures with a baby strapped to my chest, and sometimes it meant I was begging my husband to please get the children out of the house. What made studying online easier for me was having a laptop that I could take to the library if required, a dedicated studying space where I could shut the door on the children (this was a small desk set up in the corner of our bedroom as my home office does not have a door), and most importantly of all, a strong belief that I could do this and that it was important to me to finish my course and do the best that I could. All of this has stood me in good stead for now working from home in a freelance capacity. I know that there are no magic silver bullets. If you want to be successful, you simply need to DO THE WORK. I know that deadlines are there to be met, not constantly pushed out when life gets in the way. And I know that sometimes you just need to ignore whatever else is going on around the house and just get on with your work. The laundry will still be there tomorrow once the deadline has been met and no child ever died from having a toasted cheese sandwich or scrambled eggs for dinner (well, maybe if they have an allergy, but I’m sure you get my point!). With a background in public relations and corporate communications, I’m very accustomed to writing in a voice that is not my own. I’ve written a lot about products, features and services, but less about my own thoughts, opinions and experiences. It’s a safe place to write from. And, it’s given me fantastic skills in writing across a diverse range of topics and has created the opportunity for me to research and learn about many things. As a naturally curious person and a born researcher, this has been brilliant. But recently, through my work with Babes with Babes Fitness, I’ve had to step out from the safety of writing from a different perspective. Writing about your own experiences, from the gut, is raw, it is confronting and it can be painful. In some ways it is easier, as there’s no research, but it’s also harder, as there is nothing to hide behind. By writing about my daughter’s comments about body image, I revealed my own insecurities, I disclosed my (substantial!) weight to the world wide web, and I opened myself up to the potential world of trolls and negativity (thankfully, this hasn’t happened and all feedback I’ve received through social media and personal comments has been very positive). It gave me an insight into how brave many bloggers and other writers are who regularly write about their own experiences. So, will I continue to write in my own voice? The work I am doing for Babes with Babes is particularly suited to a personal narrative and by being braver about the topics I am exploring, it is creating more of a platform for discussion around that brand. It is definitely the right approach for that client, as the more personal and revealing topics are resonating more with the Babes audience. For other clients, my own voice is completely irrelevant and my personal experience of a topic is of no value to the audience. Ultimately, in considering whether to use my own voice or an entirely different tone, I will continue to determine the needs of the audience first and foremost. For any piece of writing, the audience is all that matters and as a professional writer, it is my job to know what that audience needs and determine how best to reach them. I can help you to find your voice or find a completely different voice that reflects your business and suits your audience. Get in touch if you’d like to chat about how I could help you. As a writer and an editor, one thing that you need to get used to quickly is not everyone is going to love your work. There’ll be times when you don’t get the tone quite right, where your humour misses the mark completely, or where your language choices aren’t what the client would have chosen. But the beautiful thing about writing is that there can be many ‘right’ approaches to communicating the same message and very rarely is a particular choice 100% right or 100% wrong. With this mindset underpinning my own approach to work, I was surprised recently by the experience of a writer in a Facebook group I belong to. This writer had worked on an ongoing basis with an editor on some of her larger projects. On a recent project, the writer queried some of the changes and choices that the editor had made – not necessarily implying that they were wrong, but wanting to understand the changes. The editor responded by saying that if the writer did not trust her, she should find a different editor to work with! Now maybe this editor was just having a bad day, or maybe the request for an explanation was poorly worded. But on the face of it, I was pretty shocked by the editor’s response! First of all, from a client service viewpoint, this narky response would be enough to put me off from working with this person again if I were the client. Setting the churlishness of the response aside however, I believe that it is vital that writers and editors be open to considering alternative approaches, or if they strongly believe that the choice they made is the best way of communicating with the intended audience, being able to respectfully explain and justify the reasoning behind those choices. I truly believe that feedback and the drafting process is something for writers to embrace. Feedback is a gift that makes you think about your writing and be constantly willing to improve. So, if you work with me, know that I am confident in my skills and ability to deliver copy that you will love. But also know that if you don’t love it (it happens! ), then we’ll be able to work together to make it right, without me being a prima donna about it. Tell me in the comments, do you find feedback challenging to receive? Or maybe you are ok with getting feedback, but don’t feel comfortable giving constructive criticism? Like many parents of young children, I have watched the latest Disney blockbuster, Frozen, more times in the past few months than I care to confess (it’s that rare thing – something that both my 6 year old and 19 month old can enjoy). And when I was watching it for the seventy-millionth time, I got to thinking about the lessons I could take from it as I embarked on starting my own business. I’m all for trusting your gut and intuition, but if you want a long-term relationship, it’s best to take a little bit of time to get to know each other. Of course, I’m happy to just date casually too if you’re not sure that we’ll be a good long term fit, and we can see where things go! Ah, yes, yes they do. And for me, this means prioritising self-care so I can be less stressed and make more intentional choices is a big priority. Fear is designed to keep us safe, but a lot of the time, it really only holds us back. When Elsa feared her power, she was trapped by it and held hostage. Similarly, I was scared for a long time to back my own business aspirations. But once you recognise and confront your fear, you can move on to bigger and better things. You might not be building amazing ice palaces, but it could be something nearly as cool! Not happy with where you are in the life or the direction you’re going? Then change. Don’t let your own choices hold you back. If your doubts and fears are the only things stopping you, then be like Elsa and let them go. It’s highly unlikely that you’re going to set off an eternal winter and far more likely that you’ll revel and grow in your newfound freedom. Anna was looking to Hans and then Kristoff for an act of true love to melt the ice in her heart and save her. But ultimately, she saved herself by being willing to sacrifice herself to save her sister, Elsa. Similarly, in business, you can’t sit around waiting for people to hand opportunities to you. You need to make your own opportunities, network, take responsibility for your own professional development, and be prepared to dig deep to find reserves of self-belief, no matter how deep they might be hidden. So, there you have it, five lessons that I learnt from Frozen. What lessons have you learnt from children’s movies?